When you create a new project from your Kumu dashboard, you&apos;ll be prompted to choose whether it should be public or private, and the option you choose will affect how you can share your finished project. Public projects can be viewed by anyone who has the link, and they can be edited by you and anyone you add as a contributor. They are also indexed by search engines—that is, people can potentially find your project online if they search for the right keywords. Finally, public projects can be forked by other Kumu users, allowing them to build upon your work and offer new insights. Public projects are free, and you can create as many as you want, no matter what account you own or plan you&apos;re subscribed to. We love it when you share your work, but we know that it&apos;s sometimes necessary to keep it under wraps! For that purpose, we offer private projects. Private projects don&apos;t get indexed by search engines, and they can only be viewed by you and anyone you have added as a contributor. Private projects are a paid service—check out our guide on accounts and plans to see a full list of pricing options. Both public and private projects can be shared using presentations and share/embed links, and private projects allow you to password-protect your presentations for an added layer of security. To add a contributor to a project owned by your personal account, you first need to make sure the contributor has their own Kumu account. If they don&apos;t have one yet, they can sign up for free. 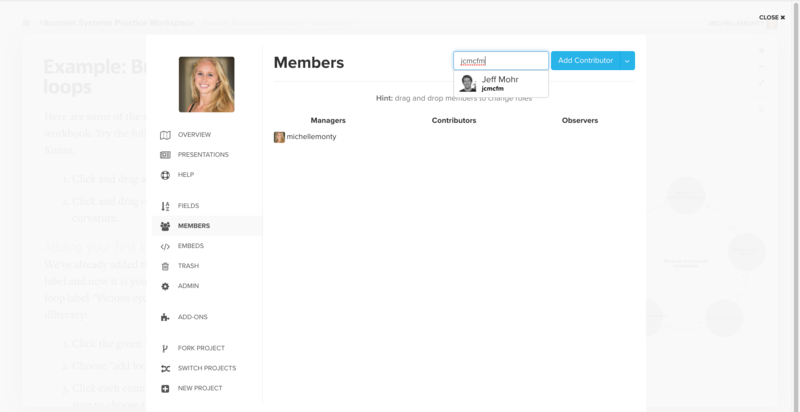 Once they have signed up, you can open your project settings, click on MEMBERS, type in the contributor&apos;s Kumu username, and click "Add contributor". Anytime you add a contributor to a project (public or private) owned by your personal account, you are granting them view and edit access. However, they won&apos;t be able to add other contributors, change project privacy, or rename, transfer, or delete the project. When you&apos;re adding a contributor to a project owned by an organization, there are a few more steps involved, but you&apos;ll be able to choose whether the contributor has view-only, edit, admin, or no access. For more information on how to add contributors to organization projects and manage their access, check out the full guide on organizations. If you&apos;re editing your project, and somebody else is editing at the same time, their changes won&apos;t appear on your screen in real-time (and vice-versa). Instead of showing real-time changes, Kumu waits until you refresh the page to sync you up with your team and show you the most up-to-date version of your project. This was a design decision we made to encourage you to carefully plan who is working on which part of the project, and when. In the long run, this kind of planning helps reduce complexity—and when you&apos;re using Kumu to tackle a tough problem, reducing complexity is vital! If you happen to edit the same part of the map at the same time (whether that&apos;s an element name, map description, view, or something else), Kumu will detect this and prompt you to review any conflicts. Let&apos;s walk through a quick example. Say you and a teammate both happened to be mapping influential people in Silicon Valley one afternoon. You both click on Reid and decide that his bio needs a bit of sprucing up. You save your changes and SURPRISE! The below screen pops up to let you know that you&apos;re not the only one editing Reid&apos;s bio today. You click "Get started" and see a window that highlights the changes between your version and the version on our servers. Lines you&apos;ve added show up as blue text with a "+&apos;&apos; sign in front. Lines that you&apos;ve deleted or someone else has added show up as red text with a "-" sign in front. ...you&apos;re all set. If only handling conflicts in the real world was this easy! Share/embed links make it easy to send somebody an interactive, read-only version of your map, or embed that version on a blog or website. To create a share/embed link, click the ellipsis icon in the bottom toolbar, then choose "Share / embed this map". 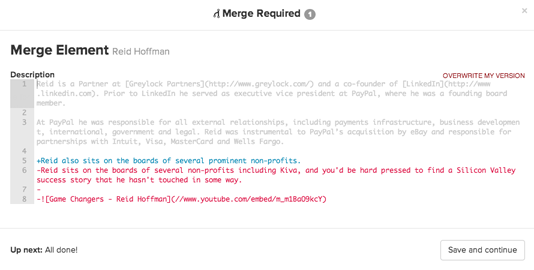 For more information about share/embed links, including customizeable options, check out the full guide. If you need to share a static screenshot of your map (for example, in another presentation software or in print), there are two ways to go about it. To quickly snap a JPEG screenshot of your map, click the ellipsis icon in the bottom toolbar and select "Capture screenshot". Note that the screenshot will be taken at your current position and scale on the map—if you&apos;d like everything to be centered, click the zoom-fit icon in the zoom toolbar, or press \ on your keyboard. When Kumu brings up your screenshot, you can right-click the image and select "Save image as..." to save the image to your computer. If you need a hi-res screenshot that can scale up or down to any size (for example, when you&apos;re printing a Kumu map on a large poster), we can create hi-res PDF files. If you have a personal account, PDFs cost $5 each, and all you need to do is click the ellipsis icon and select Request PDF. We&apos;ll email you a hi-res PDF version of your map, typically within one business day. Organization accounts can bypass this process—they have access to free, unlimited, on-demand PDFs at all times via the same ellipsis icon . We aim to complete all PDF orders for personal accounts within one business day. If you have an urgent PDF request, or you know in advance that we&apos;ll need to fill your order quickly, just let us know at prints@kumu.io. Want to make sure your labels are readable on your PDF or screenshot? Learn how to remove label overlap.